A Real Live Gnome in Pennsylvania? 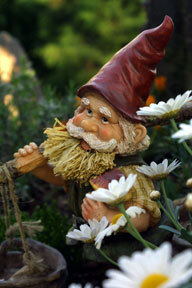 German garden gnomes (above) usually have bushy eyebrows, a long beard and conical hat, often reddish in color. August 23, 2014 Pittsburgh, Pennsylvania - In 1200 A.D., a Swedish man named Frederik Ugarph found a hard wood statue only about six inches (15 cm) high of a little person wearing a conical hat in what is now Trondheim, Norway. The statue was standing on a pedestal engraved with the words: “NISSE Riktig Storrelse.” That means, “Gnome, actual height.” Owned and housed today by the Oliv family in Uppsala, Norway, X-ray tests indicate the wooden statue is more than 2,000 years old, perhaps carved from a tree that is no longer known. Previous PostPrevious Part 2 – “Horrible Secret” in UFO Crash Retrievals Near Roswell, New Mexico, in July 1947? Next PostNext Sea Stars Continue to Die By the Millions from Alaska to California: Is It A Virus?